Definition at line 238 of file poly_roots.cpp. Definition at line 117 of file poly_roots.cpp. Referenced by dblSort3(), and mrpt::math::solve_poly2(). Definition at line 21 of file poly_roots.cpp. Definition at line 61 of file poly_roots.cpp. Referenced by SolveP4Bi(), and SolveP4De(). Definition at line 118 of file poly_roots.cpp. Definition at line 203 of file poly_roots.cpp. 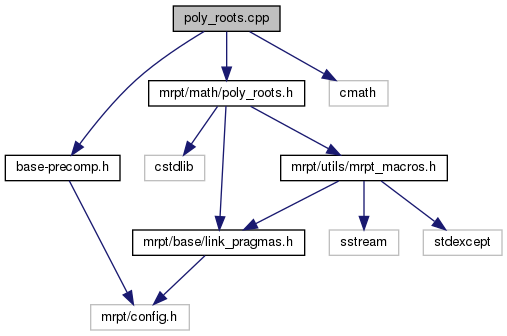 Definition at line 73 of file poly_roots.cpp. Definition at line 128 of file poly_roots.cpp. References CSqrt(), dblSort3(), mrpt::math::solve_poly3(), and SolveP4Bi(). Definition at line 240 of file poly_roots.cpp. Definition at line 22 of file poly_roots.cpp. Referenced by mrpt::math::solve_poly2(), mrpt::math::solve_poly3(), and SolveP5_1().